This walk: 2013-3-20. Steps Bridge, River Teign, Dunsford Wood, mill leat, coppiced oak, wild daffodils, leaf litter, copper beech, exposed tree roots, branched lichen, unidentified moss, coppiced stool, Dolly's Seat, leat sluice. Link to Google Satellite view of the area - Steps Bridge, over the River Teign, is at the bottom right corner of the aerial view. Previous walk at this site - 23 March 2011. Dunsford Reserve, 140 acres, contains a lot of upland oak and hazel. Rare species include the Wild Service Tree, otters, fly catchers, redstarts, dippers, kingfishers, woodpeckers and five species of fritillary butterfly. The steep-sided bracken slopes are managed for the butterflies. Steps Bridge, seen from the west, looking towards Dunsford. Looking up-river: we walked through the woods seen on the right. the South Teign River which rises near the double stone circle of Grey Wethers, flows into Fernworthy Reservoir and out again. The two rivers join together at Leigh Bridge (SX 683 876) approx. 1 km west of Chagford. Welcome notice. Click the image to see a larger version. Small panorama showing an arch at left for the mill leat and larger arches over the river to the right. Click the image to see a larger version. A tranquil stretch of river. General introductory notice. Click the image to see a larger version. Just a view of the river, its bank and various trees. Coppiced hazel with catkins, although the notice above states the trees on the valley floor are ash. The track ahead, the sun shone some of the time. Some autumnal leaves still hanging on. Exposed tree roots on the river bank, no doubt scoured away by the heavy rains of winter 2012/2013. A slight 'rapid' in the river. Unidentified fruticose i.e. branched lichen on a small branch on the ground. More autumnal leaves, probably copper beech, Fagus sylvatica f. purpurea. As previous photograph - closer view - moss with withered lichen fruiting bodies. Zoomed view - possibly the podetial/apothecial reproductive structures of a lichen of the Cladonia group? Yet another clearing with wild daffodils. A reed or grass clumped around the base of a small tree that is being eroded by the river when it is in spate. Coppiced stool - hazel or oak? Sluice to control take-off and flow in the mill leat. 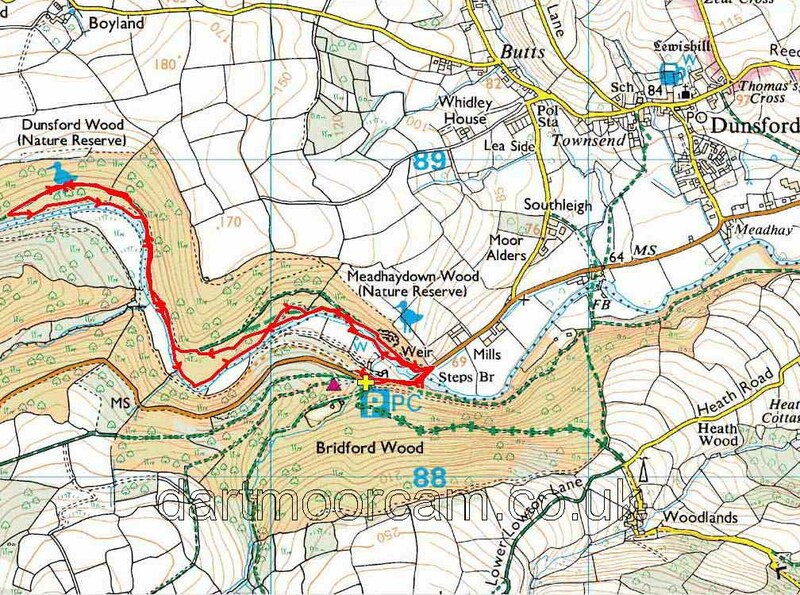 "Mills" and the leat are marked on the map, very close to the bridge. Another sign, near the bridge. "1816" on the opposite side of the road. Looking up-river from the bridge, at the weir that forms the origin of the mill leat. As previous photograph but from a different viewpoint. This walk was reached from Plymouth via the A38 by turning off after Chudleigh Knighton, this is the Chudleigh turn-off but follow the B3193 Teign Valley road, then the B3212 to Dunsford. Pass the turn-off into Dunsford and follow the road to the bridge. There is parking beyond the bridge with the main area being on the right (SX 803 883), at the the P symbol/yellow cross on the map. There is a small overflow park before this, on the left. There is also some roadside parking just before the bridge, on the right.